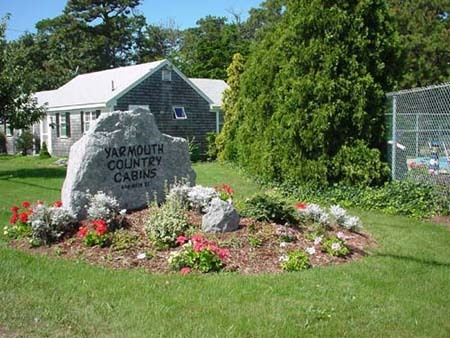 Yarmouth Country Cabins is conveniently located on Rt. 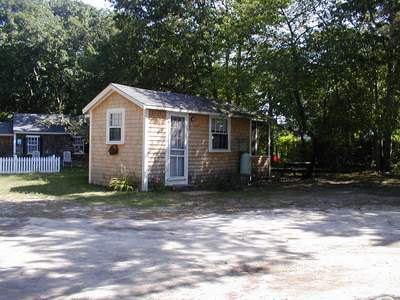 28, 3 miles from Hyannis and only 1 mile to the beautiful beaches of Nantucket Sound. Nearby are 2 excellent golf courses, churches, restaurants, shopping, theatres, tennis courts, and everything else the Cape has to offer. 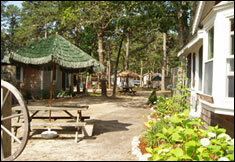 Our cabins are nestled among 10 acres of beachsand, natural landscaping and beautiful trees. 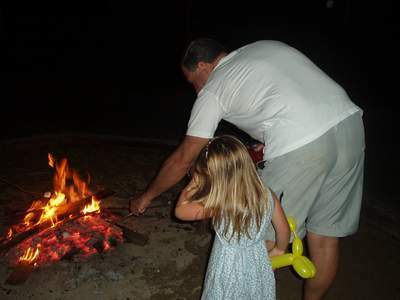 Our heated outdoor saltwater pool and beachsand playground with firepit is a hit with all families. Walk to many fun things: Diners, resturants, mini-golf, go carts, Dairy Queen, Tradewinds Souveiner Shop+Fudge Shop. View the Cabin Map! 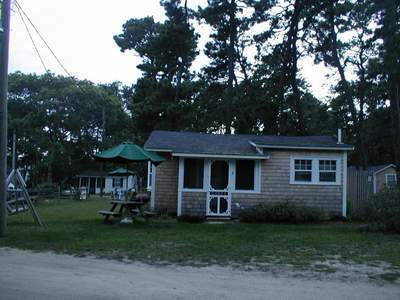 Nearly all of the cabins have been renovated, and all are quaintly decorated. Many cabins feature cathedral ceilings, hardwood floors, and screened porches. And, all are comfortably furnished and clean. All cabins are equipped with fans, cable TV/VCR, pillows, blankets, and bed linens. 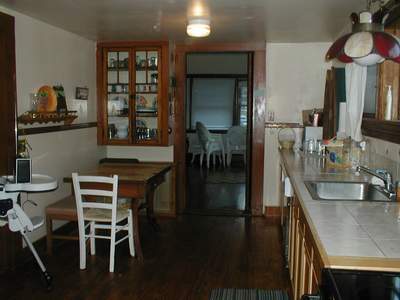 Kitchenettes include dishes, silverware, cooking utensils, basic cookware, gas stove, coffee maker, and refrigerator. We have barbecue grills on the premises as well for your use. Please note that paper products and towels are not supplied. Why are they called cabins? The cabins have everything a cottage rental or house would have (and more)...so why are they called cabins? Yes, we are asked this question often. The cabins are all wood framed, hardwood floors, mostly wood walls, vaulted ceilings, ceiling fans, and screened porches. The rooms are adequately in sized. Rooms have enough space you need. The cabins are not huge but have a grand amount of outdoor space. There are 10 acres here at YCC. The cabins are spaced amongst 5 of the 10 acres. 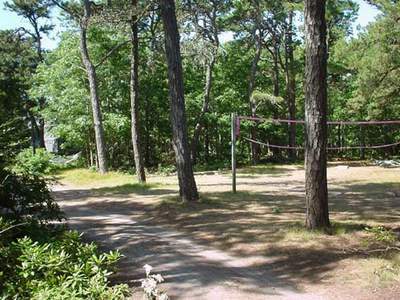 The paths around the cabins is hard packed sand; very little asphalt. There are SO many trees, natural landscaping, flowers, numerous birds, firefly's, bunnies bouncing around and butterflies. Nature in abundance. All of the cabins have A/C. All cabins have plumbing and electricity. Kitchens have propane cook top and/or oven. Most of the cabins have an enclosed outdoor hot shower as well as the indoor hot showers. Only a few of the rentals have a bathtub. If that is important to you, look at cabins #10, #12, #24, #28, and #30. The property feels like a campground. This property is in nearly the original form as when it was built in the 1950's. 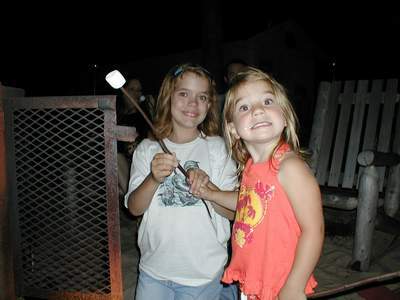 Since then, bathrooms were added and we made major cabin renovations which were finished in 2006. The cabins are updated on a regular schedule. 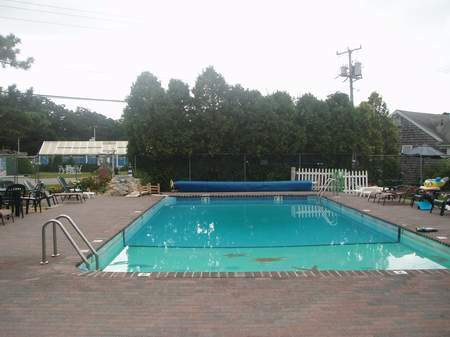 The property has been owned by a family and operated as a family business. Families that have owned this property are the Dayton, Caruso, and Sylvia Families. 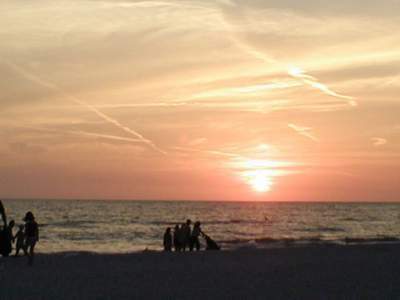 If you have a story about any of the owners or stayed on the property, we are always eager to hear from you and make new friends. We welcome your family. 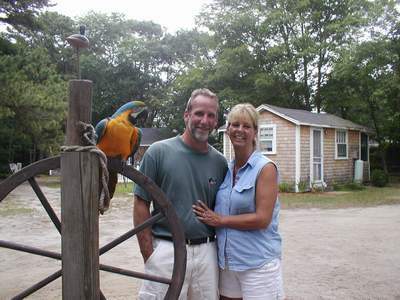 Stop in a see us anytime you are on the Cape. We're easy to find! Turn at the rock! Everybody loves the heated salt water outdoor pool-especially the kids! 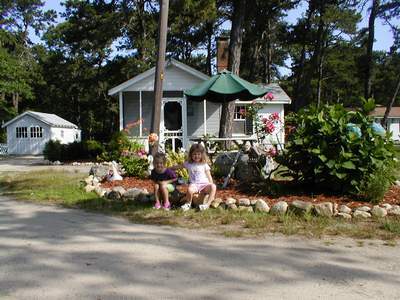 We've got a jungle gym, log swings, hammocks, and a special cabin for kid's games. Beachsand everywhere! A quiet cabin for rest and relaxation! That's a cabin? 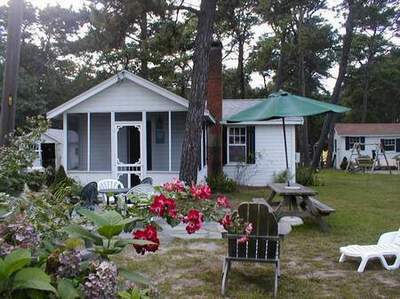 The 4-bedroom/2 bathroom house sleeps 12 with ease! Room for the entire family! Plus a large deck and an outdoor shower! Parking for 5 cars. 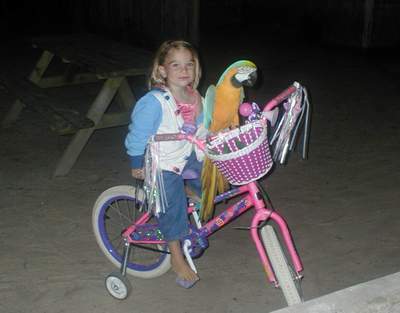 How about a bike ride? We have kids bikes to borrow. 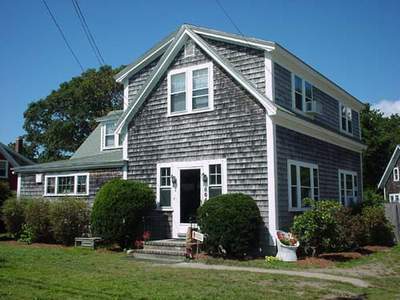 Charming cape cod styling inside and out. The beaches are never far. Just one mile away. Fun for the entire family. Good pets are welcome. at the end of the nature trail. Just a quick nature walk through the woodlands. Beware of insects and ticks.